Inspired by another post and nostalgia, I made a trip to the Hoagie Hut today. 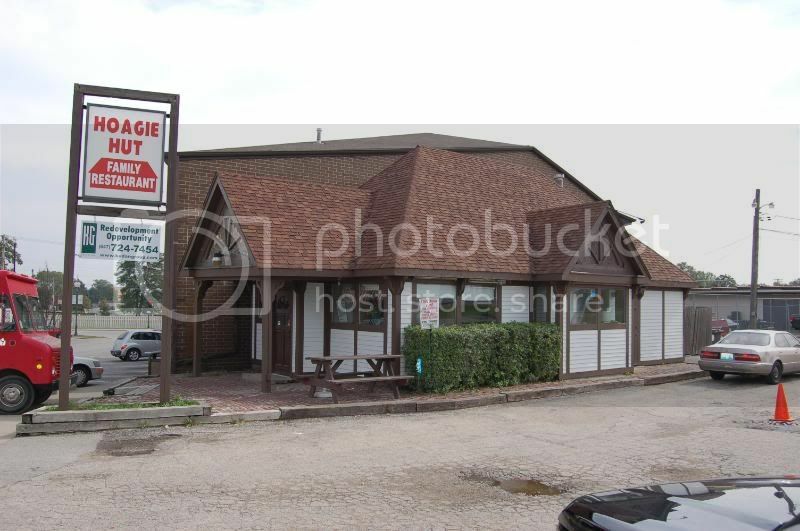 For a certain segment of people who grew up on the North Shore from Highland park to Lake Forest and were underage patrons of Rainbows Bar (RIP) and the Wooden Nickel in Highwood, The Hoagie Hut was a de riguer stop after a night of drinking and carousing. I have been to the Hoagie Hut at least one hundred times and have only ever ordered the Cheese Steak Hoagie. 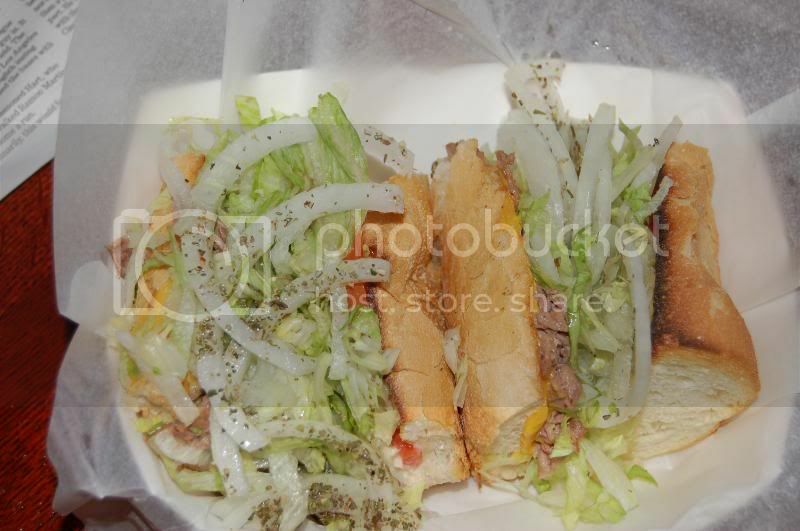 It is neither a cheese steak in the Philadelphia style or a "Hoagie" in the true Deleware to Philly definition of Hoagie as this version is served hot. Some people might call it a Grinder. I call it a CSH. 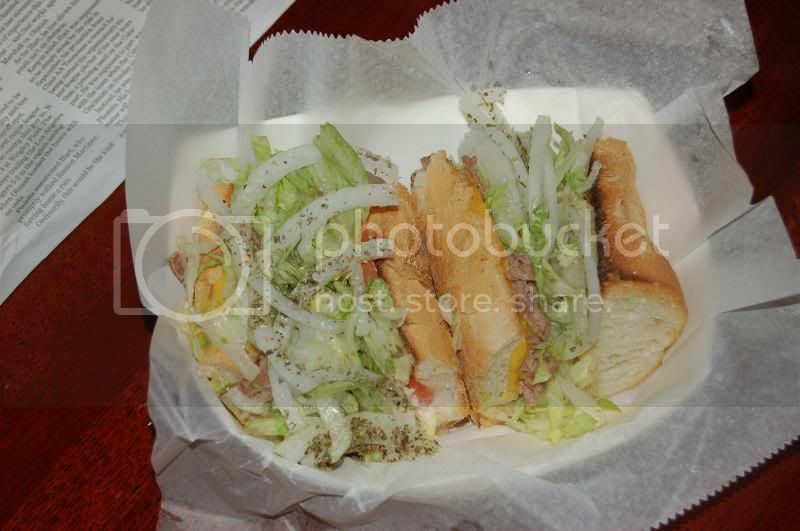 Gonnellla Bread, unidentified grilled beef, tomatoe, mayo, lettuce, onion and american cheese. Topped with Italian spices and your choice of catsup, mustard and/or hot sauce. Greasy, gooey and good. Sadly, Hoagie is to be no more. Sure there is a "franchised" version in the city and a second outlet in Waukegan. But they are not the same. After 41 years serving the mispent youth of the North Shore...closing on Nov. 14. Chris informed me that this prime piece of property is more valuable to its owner as anything other then Hoagie Hut. One more Cheese Steak for old times sake. Looks like a good sammich. At least you got a last visit in. Such a shame, great place. I also don't mind the one in Lincoln Park, but the original Highwood location was the best. Wish I had chance to go before the closing. Look on the bright side. Maybe you'll get a Quizno's or a Washington Mutual, though. This is depressing news...I'll have to get at least 2 or 3 more trips in before the headstone is engraved on 11/14/07. There's one at the intersection of Rand and Dundee in Palatine. When I worked in the area some people just loved it. I found it OK.
wesuilmo wrote: There's one at the intersection of Rand and Dundee in Palatine. I think they tried to franchise this place several years ago...there was one in vegas and one in roscoe village too (both now closed). IMHO, none of the other locations make the same CSH as the highwood location. When I was in high school we did hoagie runs up to Highwood as cross-country workouts, and I have fond memories of pulling that foil wrapper back and digging into a big sandwich of chewy bread, meat, melted cheese, shredded lettuce, and warm oil. I think I mentioned in another post that I stopped by recently for the first time in years and was bummed to find the interior much darker and grimier than I remembered. The sandwich was good, though, and I'll stop by again to get some more while I can. Thanks for the heads up, iblock9. The one at Rand & Dundee in Palatine has been closed for close to 5 years...I believe it has been 2 unsuccessful chicken places since it was The Hut. Driving through Highwood this evening I saw another of the old guard has closed: Al & Jane's Restaurant and Tavern. I cannot say I was ever a fan of the place, though it was a regular haunt for older folks. I have a sense those who went to Rainbows and Wooden Nickel wouldn't be caught dead in Al and Jane's. The kids and I dined at the Hut last night, and Chris told me that they were going to build a Caputos market in the space, which would be nice but it doesnt seem like there is enough land there to do it. He also told me that Felix's Kitchen across the street had a new owner and that the food was better. Felix sold the enterprise to his cook, because he wasn't earning enough income. I imagine any improvements come from the cook having free reign instead of following Felix's methods. My friend Helen said the new owner is not as flexible as Felix once was. Every substitute Felix would grant, the new owner-cook will not. Caputo's are friends of the Viti's, which gives some credance to this rumor. I agree on the location may not be ideal. However I would welcome a Caputo's with open arms. No signs of Bacio's re-opening. I heard a rumor they may have re-opened in Lake Forest, but have nothing solid beyond that. Cathy2 wrote: However I would welcome a Caputo's with open arms. The people next to us at the Bears Cowboys tailgate had some incredible habanero jack cheese that they let us sample. When I asked where it was from they said Caputo's...here's hoping that rumor is true. That was my report straight from the couple who ran it. It was accurate, but not realized for whatever reason. 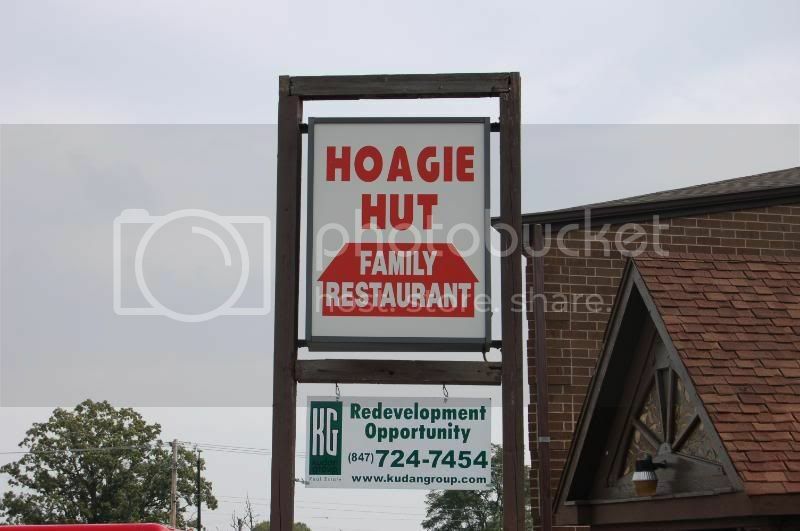 I feel a pang of nostalgia for the Hoagie Hut, but to be honest, I think it went "Half Day Inn" long enough ago that I shouldn't be sad to see it go. I sent the closing news around to all my sibs. One brother had the kind of nostalgic reaction that I had had. What's next? he asked in dismay. Another brother gently broke the news to him that Scornavacco's hadn't been Scornavacco's for a long time. Ah, the disco days ... sniff. 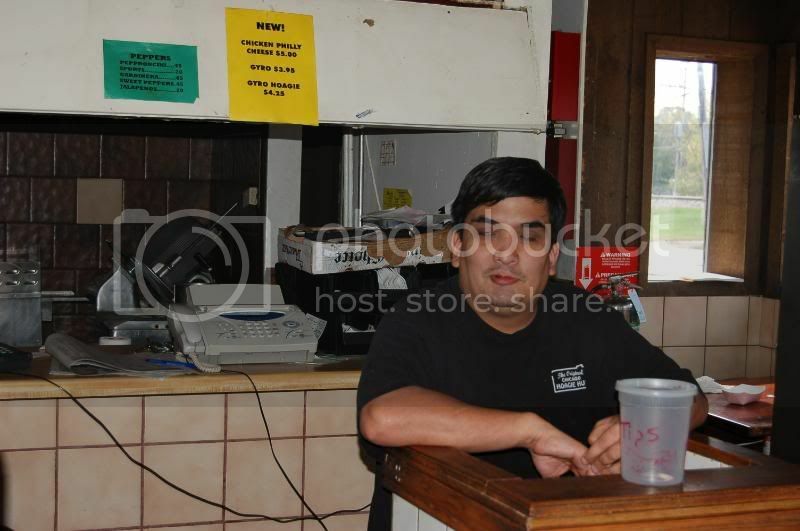 I went over to the Hoagie Hut the other day for a couple of steak and cheese hoagies to go. When I entered the chef was complaining about high rents to a couple of regulars. While I waited for my food a woman that he knew entered and they had an unpleasant conversation about a repo man. He turned abruptly and did not successfully wipe the irritation off his face before he thrust out toward me the white paper bag with the two hoagies. I felt bad for him, but couldn't think of anything useful to say. On the way out of Highwood, I saw that my dad's longtime favorite, My Favorite Inn, is now going to be a rug store. sniff. That Irish pub? Still not open. Not even any signs or names or anything visible. Seems a step backward from the last time I went by to see. p.s., I'd be thrilled with a Caputo's there, and thanks to Gabe Viti if he had something to do with making that happen. I was at the hut today and the closing sign was down. I asked Chris if they were closing and he said that he didnt know. Apparently things are up in the air for now. The latest Hoagie Hut update.......closing probably the end of December....still planning to put a caputos in, "we have a quarter acre here, there is plenty of room...the lot goes all the way to the city garage." I still dont see it fitting, but it would be nice. 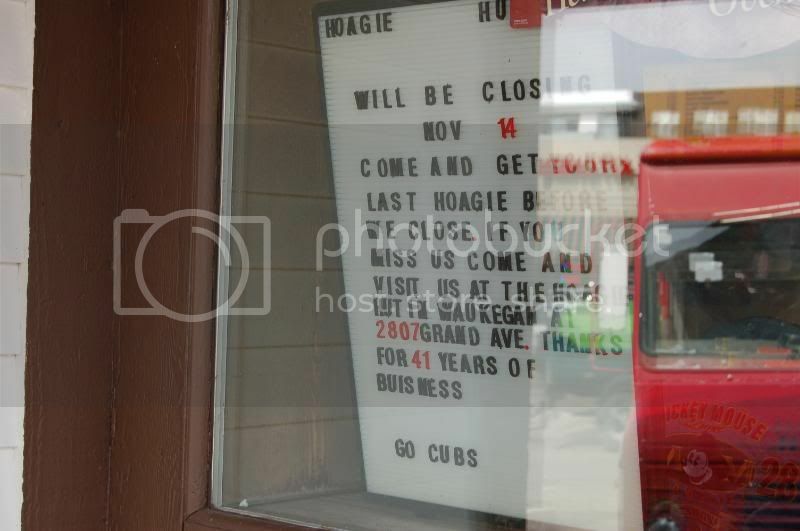 There is a sign in the window stating that The Hoagie Hut will be relocating in Mid-March to the 400 block of Sheridan Road in the space next to The Curry Hut. No word on how the plan on moving 40 years worth of grease & grime to the new location. had an old manager that used to drag me here for lunch. I say drag only because i just could not get into the food here. I always thought it was somehting you had to have grown up with like he did and that there was more nostalgia involved vs. good food. Excellent news! I'm trying to picture the space next to Curry Hut...would this be the location of Papa Romeo's pizza? I wonder if that place closed and the Hut is moving in, or if I'm off target on where they're moving. They closed their shop, though they still own the building. You can get their spices via the internet or at some farmer's markets during the summer and often at Maxwell Street. Caputo's did buy the land where Hoagie Hut resides, though I'm not sure which Caputo brother. A Highwood mover and shaker agreed the land footprint and parking around there seemed tight. He suspects there might be a land swap in the offing. Adjacent to Hoagie Hut along the tracks is the City of Highwood's storage and maintenance garage. He wouldn't be surprised if this rumored Caputo's expanded into that space. This is conversation I had back in November, which may be a bit dated. Hope HH can make it in the old Papa romeo's space....seems like it might be slightly higher rent! Poeta's has a whole rack of Lets spice it up products. WillG wrote: Poeta's has a whole rack of Lets spice it up products. Poeta's is the butcher and small grocery store on the west side of the tracks south of Washington AVe, which Tacos el Norte is situated. They will also make Italian sandwiches to order at lunch time. I have heard that Hoagie Hut is now reopened in the old Papa Romeo's space 2 doors north of the Curry Hut. All is right in Highwood! Viva the Hut, I know what I'm having for lunch on Saturday now. Thanks for the update! I drove past there yesterday. I didn't see signs of them having come back to life yet. Of course, I could be wrong. I simply suggest calling in advance to assure yourself it is open to avoid disappointment.